Coffee has a long history in monasteries around the world; it is a beverage that has helped monks stay awake and alert during their long days of prayers and manual work. 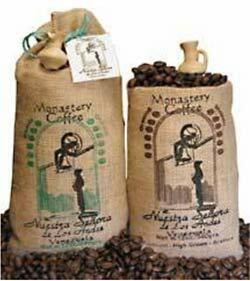 Monastery Coffee, a unique product developed as a project for Cistercian-Trappist monks in Venezuela, is worthy of support. In 1987 the Monastery of Our Lady of the Andes (Monasterio Nuestra Senora de Los Andes) was founded in the Archdiocese of Merida, Venezuela. The Cistercians who founded this new monastery trace their history back to 1098. At that time, saints Robert, Alberic, and Stephen, and about 20 of their companions seeking a new site to practice a devout life, arrived at a marsh (which the monks soon drained) near Dijon, France, called Citeaux. They wished to return to the simplicity of the monastic life prescribed by Saint Benedict (ca. 480-543), without the additions and interpretations that had accumulated over an interval of over 500 years. Under the direction of St. Stephen Harding and with inspiration from St. Bernard of Clairvaux (1090-1153; later declared a "Doctor of the Church"), the Cistercian reform extended over all of Europe in the 12th century. After another five hundred years, in the 17th century, Abbot DeRance introduced-in his monastery of LaTrappe, France-a new reform, seeking the original ideal of Citeaux. At the end of the 19th century this Trappist reform became an Order (The Cistercians of the Strict Observance; commonly referred to as Cistercian-Trappist; see the section below regarding their spirituality). Cistercian-Trappists arrived in Latin America in the 20th century. There are now 13 monasteries: 6 of nuns and 7 of monks. Venezuela already had a monastery of Trappistine nuns when the founders of Our Lady of the Andes arrived from the Monastery of the Holy Spirit, in Conyers, Georgia (U.S.). The monastery is located in the heart of the Venezuelan Andes, in the State of Merida, on a slope across the Chama River Valley from the town of Chiguara. The monastic community established a small coffee plantation to provide meditative labor and to cover most of its expenses. It also obtains some funds from its Retreat House (where visitors to the monastery can reside) and the Casa San Bernardo (for group retreats). The monks use the latest technology in producing coffee while adding the special touch of their 900-year monastic tradition to produce a top quality product. They grow arabica beans, which are milder and more flavorful than the harsher robusta beans used for many ordinary coffees. Because of the weather and soil conditions as well as careful tending of the plants, Monastery Coffee has a rich flavor. This coffee bush begins to produce only after about five years, and yields enough berries to make just one pound of roasted beans per year. The berries are hand picked; the bean is separated from the pulp and set to dry in the sun. This is a delicate process that can last several days and has to be personally tended. The drying beans are raked every half hour, producing something like a Zen garden (pictured above). The coffee beans are then roasted to make coffee ready to use in whole bean and ground forms. Cistercian-Trappist monks are Catholics who, having heard God's call to live a life of intimacy with Him, have found in solitude and silence the best way to respond to that call. The man called to be the monk feels he can best listen to God's Word in the interior space created by external solitude and silence. This is difficult to understand in a culture where crowding and noise void the sense of who we are and the meaning of our lives. Monastic life awakens us from this illusion and enables us to listen, understand and respond to God. The Monastery of Our Lady of the Andes. The Cistercian monk also perceives that solitude must be lived in communion with others, especially with those who have received the same call. We know that it is from our own true center in God that we can live in authentic community and that we need community in order to grow as children of God and brothers to all. This fellowship is experienced first of all within the monastic community itself and is extended to those around us through the hospitality and sharing offered at the retreat house as well as through the necessary contacts related to work and to the diverse structures of today's world. Both modes of communion are at the service of our communion with God, which ultimately authenticates and deepens all other forms of communion. Listening and responding to the Word of God constitutes the dialogue which takes place in prayer which is at the center of the monk's life. Prayer has two forms. The most visible one is that which the monks undertake in common. We gather in the church seven times a day in order to confront the Word of God which reminds us of God's constant presence and which invites us ever to abide in it. This form of prayer is our public praise and we express our solidarity with mankind by elevating petitions for the Church and the world. The less visible form is personal prayer hidden in the heart, which the monk strives to maintain alive throughout the day. It is an on-going dialogue with God, present in each of our acts. Work, especially manual labor, is another area where the monk relates to God, to his brother monks, and to all of humanity. By our work we earn our living, as all people must, but by it we also praise God and help to build a better world. Our life is strictly contemplative. We do not engage in any apostolic, pastoral, or educational ministries. A contemplative community is a sign which invites all people to enter more deeply into their own hearts in order to listen to God with that openness which allows Him to act in their lives at all times. Putting the beans in the hopper.